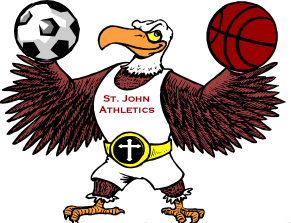 The Saint John Athletic program provides a safe sports environment that serves as an extension of the school’s academic and religious programming. It is designed to develop within each athlete Christian values and Christian attitudes toward one another. All participants will learn the fundamentals of each sport and be given the opportunity to cultivate strong, healthy and disciplined minds and bodies. Participants will also develop a sense of good sportsmanship, fair play, and team spirit, as well as facilitate and enhance the moral and ethical development of all those involved. Slogan: "Let...The players PLAY, the coaches, COACH, the referrees JUDGE, the spectators CHEER, And May all GIVE GLORY TO GOD! so that our efforts give greater glory to You. and guide us in fair play. For this we pray, in Jesus’ name, Amen.